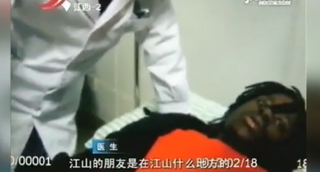 This teen, identified only as Pratt, was found near a Chinese riverbank. One love-struck Ohio teen almost died on a Chinese riverbank after getting drunk once he was rejected by the young woman he flew 7,000 miles to see, the Daily Mail reports. Identified by only his surname, Pratt, the 18-year-old flew from Ohio to Jiangshan, a city in Zhejiang province, China, after reportedly falling in love with a young Chinese woman he met online. However, the infatuation was not mutual. After being rejected, he got drunk and was later discovered battling hypothermia and unconsciousness on a staircase leading down to a river, the Daily Mail notes. “He was unconscious and lying in a pool of his own vomit. It looks as if he might have fallen in the water at some stage as his clothes and shoes were soaked. To be honest, he was so inebriated, he could easily have drowned. It was only a short distance to the water,” a Cheng Bei Police Station representative said, according to the Daily Mail. The teen was taken to a hospital, where he regained consciousness, only to find out that he had also lost all his money. The manager of the hotel where he was staying felt sorry for the teen and allowed him to remain in the room for free. Pratt told police that he didn’t know his would-be lover’s real name but that she is known online as Xioqian. He fell in love, apparently, because of her perfect English and amazing photographs.